Hi everyone and Happy Friday!!!! Today I have a quick and easy meatless meal to share with y'all. Are you a fan of stuffed peppers? I grew up eating my moms traditional stuffed peppers, with rice, meat, and a yummy tomato sauce smothered on top. I recently made these Baked Bean Stuffed Peppers, filled with Mexican corn, jalapenos, spices, and Bush's Baked Vegetarian Beans. These meatless stuffed peppers were so delicious, that I didn't even miss the meat. We don't usually eat too many meatless meals at our house, but a few here and there is always a nice change. The first time I had these stuffed peppers was about 2 years ago on a summer blogging trip to Bentonville, Ar. It was definitely love at first bite, and I had to find out how they were made. I headed over to the grilling demonstration and chatted with who was preparing these delicious peppers, because I had to have the recipe. To my surprise it was a Bush's representative who explained how to make these easy stuffed peppers. I couldn't wait to get home and recreate this wonderful dish. The original cooking method for these peppers is to grill them, but they're just as good baked in the oven. I added a note at the end of this post to include the grilled version just in case you would like to give it a try. Grilling the peppers gives the baked beans a nice smokey flavor. 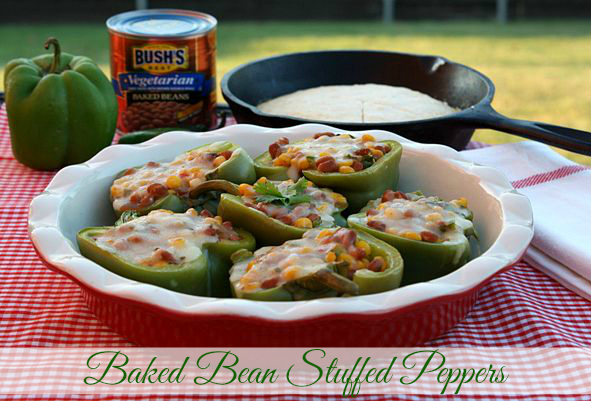 You can use any variety of Bush's® Baked Beans for this recipe. I used Bush's Vegetarian beans, but any of the baked bean varieties will work. 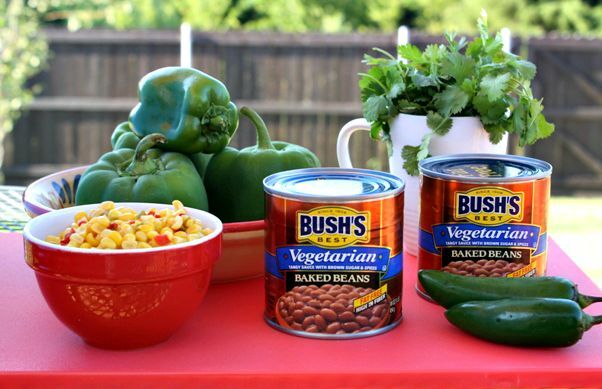 If you want to heat things up a bit try Bush's® Sweet Heat Beans, they're the perfect combination of sweet and spicy. I've had a tasty summer playing around with all of Bush's different baked bean varieties, and coming up with new recipes. Sometimes it's nice to go a little out of your comfort zone and try something new. I have to say there's a lot more to canned baked beans then just serving them as a side dish. 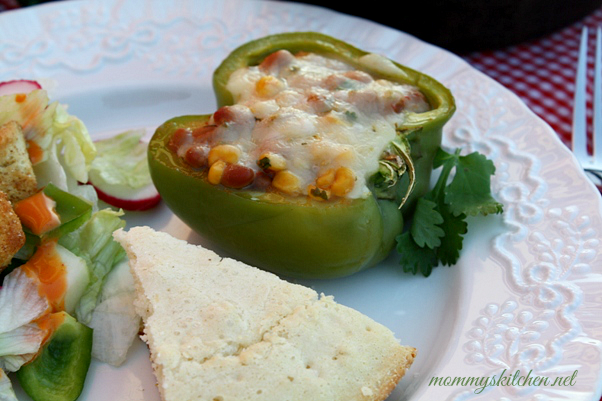 Lets get started and I'll show you how to make these easy baked bean stuffed peppers. Start by cutting each pepper in half lengthwise and remove the seeds and membranes. Place halves cut side up into a 13 x 8 inch baking pan or similar. In a medium size bowl add the baked beans, mexicorn, onion, garlic, cumin, jalapenos, cilantro, salt and pepper. Lightly mix to combine. Spoon about 1/4 cup filling into each pepper half. Pour one cup water into the pan surrounding the peppers. Cover pan tightly with foil and bake at 350 degrees for 45 - 50 minutes or until the peppers are soft. Remove pan from oven. Sprinkle shredded cheese on top of each pepper and return the baking pan to the oven for 5 minutes or until the cheese is melted. 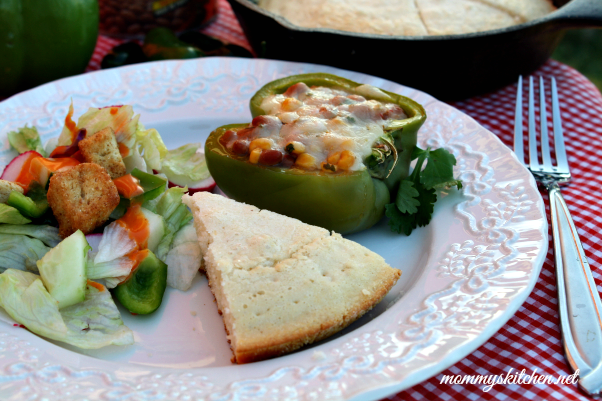 Serve these delicious stuffed peppers with a garden salad and a wedge of cornbread. I hope you enjoy these as much as we did. 1. Cut peppers lengthwise in half and remove the seeds leaving stem on. Place halves cut side up into a 13 x 8 inch baking pan or similar. 3. In a medium size bowl, add the baked beans, mexicorn, onion, garlic, cumin, jalapenos, cilantro, salt and pepper. Lightly mix to combine. 3. Spoon about 1/4 cup filling into each pepper half. Pour one cup water into the pan surrounding the peppers. 4. Cover the pan tightly with foil and bake at 350 degrees for 45 - 50 minutes or until the peppers are soft. 5. Remove pan from oven. Sprinkle shredded cheese on top of each pepper and return the baking pan to the oven for 5 minutes or until the cheese is melted. Grilled Version: Cut each bell pepper in half, remove seeds and membranes. Mix the filling ingredients together, and spoon 1/4 cup filling into each bell pepper. Place the stuffed peppers cut side up in a large cast iron skillet, place the pan on the grill at indirect heat and cook at 275-300 degrees for 40-45 minutes or until peppers are soft and cooked. Top with shredded cheese and return peppers on the grill until the cheese melts. 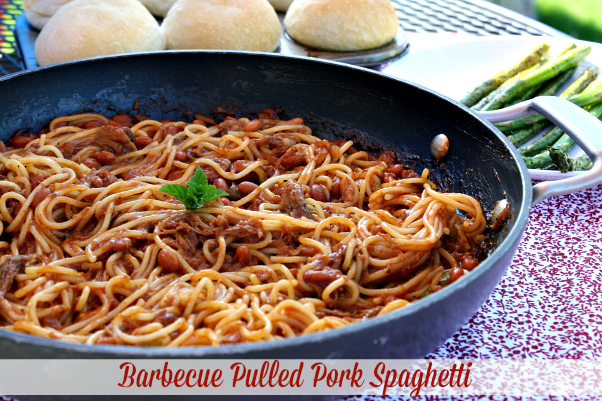 Check out my Barbecue Pulled Pork Spaghetti for an easy skillet meal made with spaghetti, pulled pork, barbecue sauce, and Bush's Brown Sugar Hickory Baked Beans. 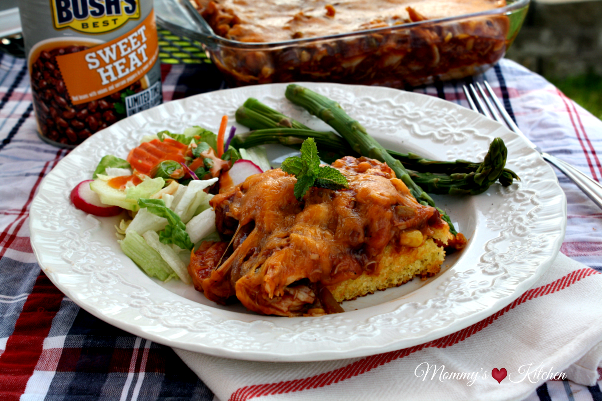 If you love casseroles this Barbecue Chicken Cornbread Casserole is a wonderful choice. This casserole starts with a cornbread bottom, and is topped with rotisserie chicken, barbecue sauce, Mexican corn, and Bush's new Sweet Heat Beans! For even more ways to use Bush's® Baked Beans, stop by Done This with Beans and see Chef Jeffrey Saad's take on some tasty new dishes. I got ready to make this for dinner tonight but I must be blind because I don't see where you say what temperature to set the oven?? We're going to wing it & hope everything comes out tasting good! Cover the pan tightly with foil and bake at 350 degrees for 45 - 50 minutes or until the peppers are soft.